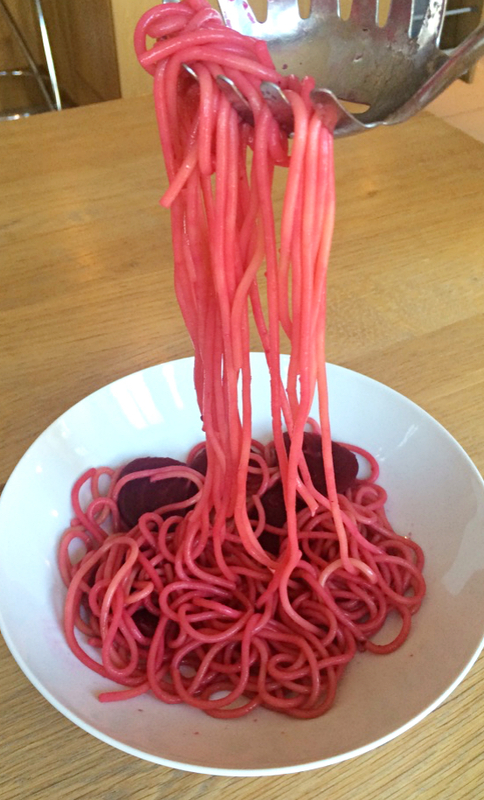 So I decided to perform my own science experiment (kind of) based all around beetroot. Beetroot is becoming increasingly popular because 1) It has fantastic health benefits – high in fibre, packed with vitamins and minerals and full of the antioxidant betacyanin (the pigment that gives the colour); 2) More and more farmers are starting to grow it here in the UK and 3) Its so so pretty. 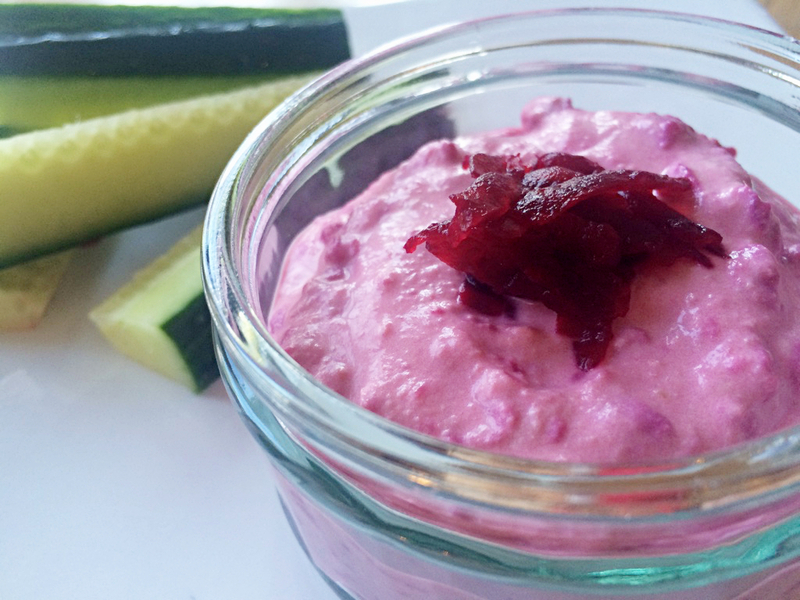 A couple of weeks ago, I made coleslaw and added grated beetroot, which made it bright pink. So, this triggered me to perform this ‘experiment’ with beetroot and see what other foods it can be added to, to make mealtimes pink. Just a word of warning, I’m not the world’s best chef and I’m sure most people would be able to do a much better job than me, but if I’ve at least inspired people to use beetroot more in food, then I’m a happy bunny. Firstly, here’s some coleslaw. 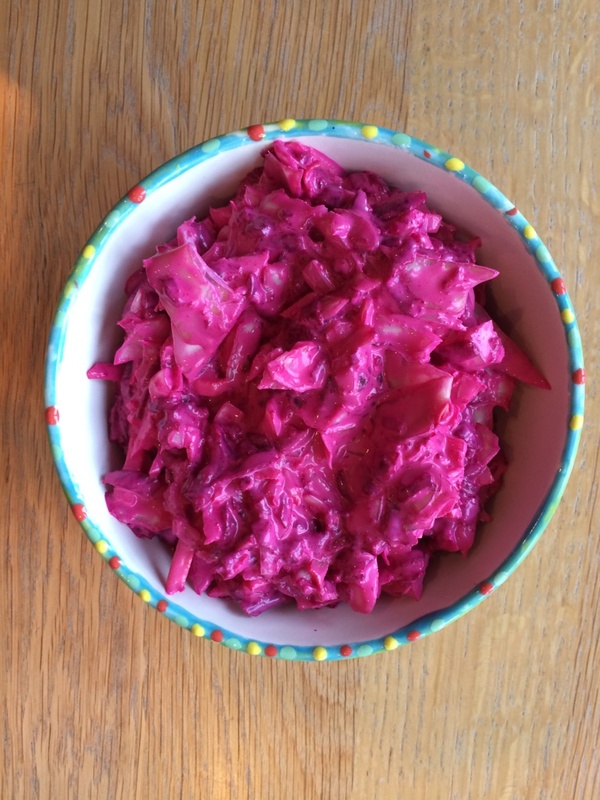 A basic coleslaw recipe can be found anywhere online, but just add grated beetroot to the classic carrot, cabbage and onion mix and this is what you’ll end up with. 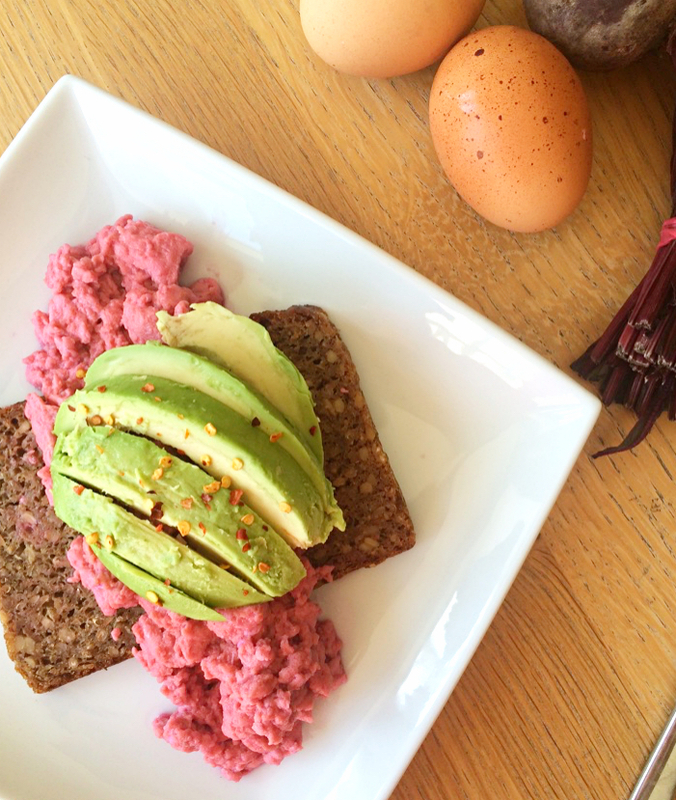 Scrambled egg and avocado on rye bread is one of my all time favourites (especially because I feel super healthy after eating it too) so I thought I’d figure out how beetroot would work with scrambled eggs. And voilà… You have to be patient with it, as the beetroot juice makes the eggs runnier initially but its well worth the wait. Now, I bake a lot of cakes but I very rarely bake bread so this was a rookie move. 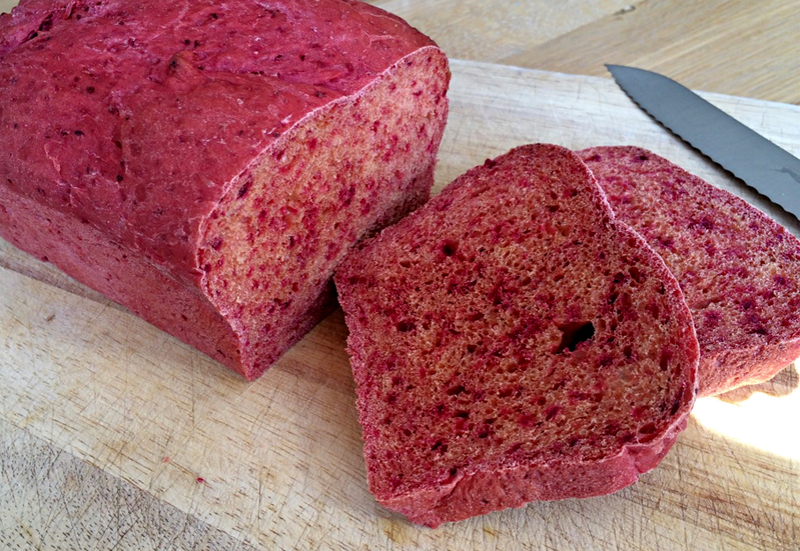 But it looks like bread, it tastes like bread, and its pink, so I think I did it?! I was also very surprised that my GCSE Food Technology techniques were still hiding up there somewhere (thank you Mrs Arter). 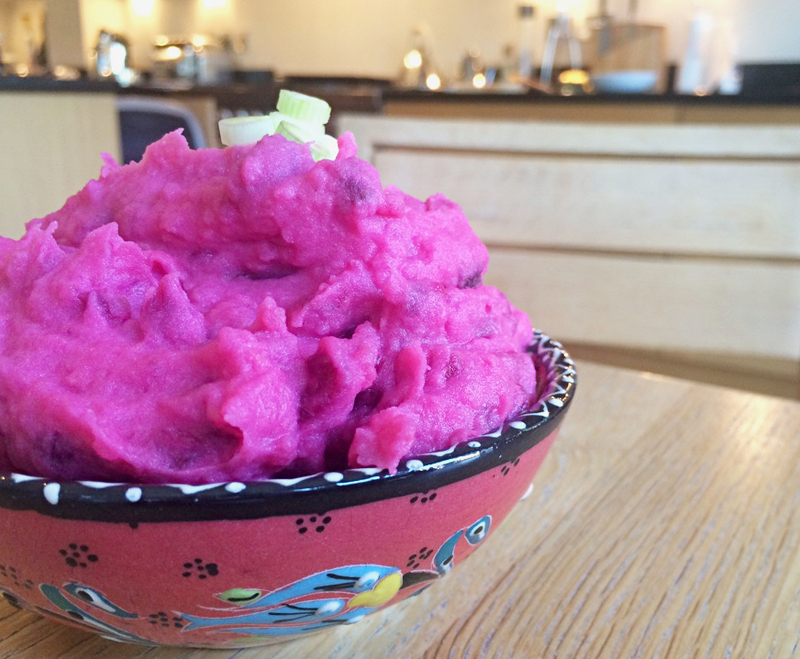 Mashed potato is super easy, and if you just add cooked beetroot to the potatoes when they’ve got a couple of minutes left to boil and then mash with crème fraiche, it’ll be very very pink indeed. 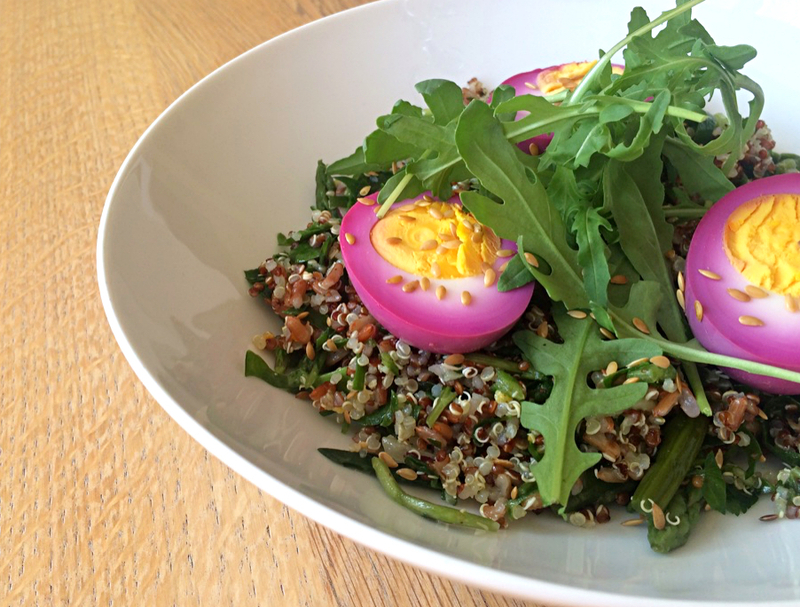 Eggs again – but this one’s a cracker in salads. Hard-boiled eggs stained with beetroot. If Barbie ate carbs this is probably what her pasta would look like. (I personally think this looks like worms and won’t be doing this again). Finally, our beloved houmous. You can make it from scratch or buy a ready made pot and add either grated or blended beetroot depending on how you like it. So, this is about as ‘foodie’ as this blog will ever get, but I hope it’s inspired people to experiment too. If you want any of the recipes just email/message me!